In ReclaiMe Pro, you can manually create a region on any storage, be it a regular physical disk, RAID, or another region. Region is a contiguous area allocated on the parent device by specifying start offset and size. Once a region is created, ReclaiMe Pro handles it as any other device. To create a region, you need to select a device in the device list and click Manual region. The Create region window appears where you need to set the region parameters: name, start, and size. Note that it is possible not to set size, but mark Create region till the end of the parent instead. It is possible to select multiple devices at the same time. In this case, identical regions are created on all the selected devices, one per device. This is useful when you need to define a set of regions to analyze a RAID. In ReclaiMe Pro, you can define a RAID manually instead of using the automatic mode. The Manual RAID button is active even if no device is selected since when the Define RAID parameters manually window appears, you can add any device from the device list. As for disk image files, at this stage you can use only the images loaded at the start. Once you set all the needed parameters and click OK, you see the RAID under the Reconstructed RAIDs section along with all the found partitions on it in the Disk and partition list window. To add disks to a RAID, click the Add... button and a drop-down list of all available devices appears. Note that once you add a particular device to the RAID, it is removed from the available device list. The added device is inserted to the member disk list under the currently selected device. To add a missing disk, use the Add missing button. ReclaiMe Pro gets the disk order based on the numbering in the first column. To move the device within the list, use the Up and Down buttons. To remove the device from the list, select it and click Remove. To edit offset and size, double-click the corresponding fields. The default value for offset is 0 while size is preset to the total device capacity. Offset and size are specified in 512-byte sectors. On the right, there are selectors using which you can set the RAID parameters. JBOD/Span and RAID1. For these layouts all other parameters are meaningless and are therefore disabled. RAID0, RAID1E, and RAID10. These layouts require to specify the block size. For RAID1E, you need also to specify "near" or "interleaved" configuration. RAID5. It is needed to specify the block size, parity rotation (left or right), and data block pattern (synchronous or asynchronous). If you deal with a delayed parity RAID, you need to set the delayed block size and first delayed block as well. RAID6. 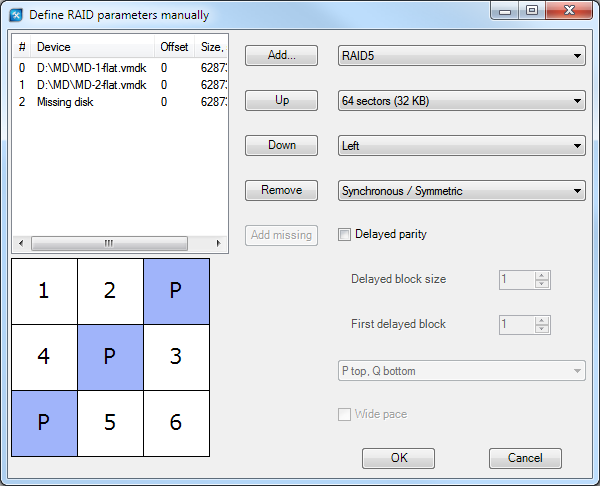 The layout requires you to specify, in addition to the parameters used in RAID5, how two parities are located as to each other (P top/Q bottom or Q top/P bottom) and whether wide pace is used. The block size is set in 512-byte sectors. For all array types, offset and size must be specified. Once the manual RAID is configured, consider scanning it for complex partitioning schemes like md, LVM and BTRFS – check "Scan for MD/LVM/BTRFS". Scanning for simple partitioning schemes like MBR and GPT is done by default. For some layouts ReclaiMe Pro can provide RAID visualization based on the specified RAID parameters. Such a visualization is aimed to help you check the correctness of a manually created RAID. Visualization is available for the following layouts: RAID0, RAID1E, RAID10, RAID5, and RAID6. Visualized RAID is placed at the bottom of the window under the member disk list. Note that RAID visualization is refreshed every time you change any of the RAID parameters.